…is the capital of Latvia - Riga. The weather is cold even for April. Snowflakes flying. But the beauty of the city is breath-taking. Around almost every corner you find completely different architecture, colours, and atmosphere. My boyfriend and I have been planning a city break for awhile now, and this time we decided to go for a place we have never been before. Somewhere less likely to go when thinking of going on holiday. Exploring and discovering new cities, cultures and cuisines is always exciting, especially when it’s done with your partner in crime! …is The Redstone Boutique Hotel, situated right in the heart of Old Riga. 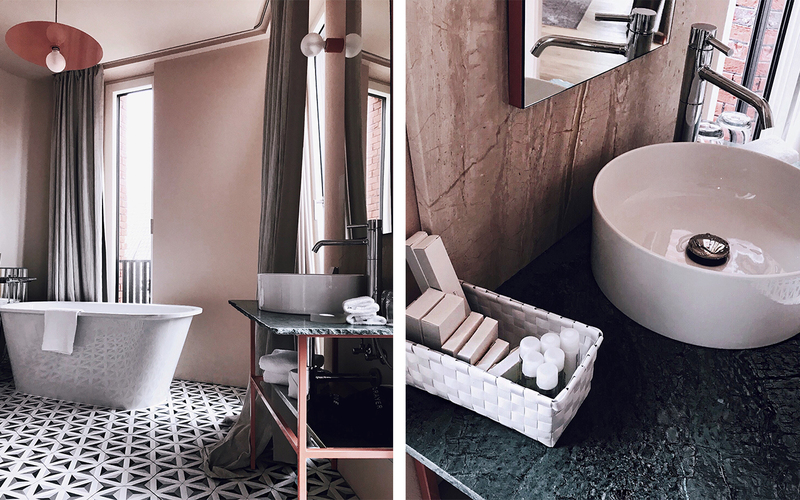 The most stylish and Instagrammable hotel I’ve ever seen! The building consists of 11 suites with varying categories from Prestige Superior to Royal, and Imperial Suite. Each one bespoke designed, inspired by the art, historic and cultural heritage of Old Riga. 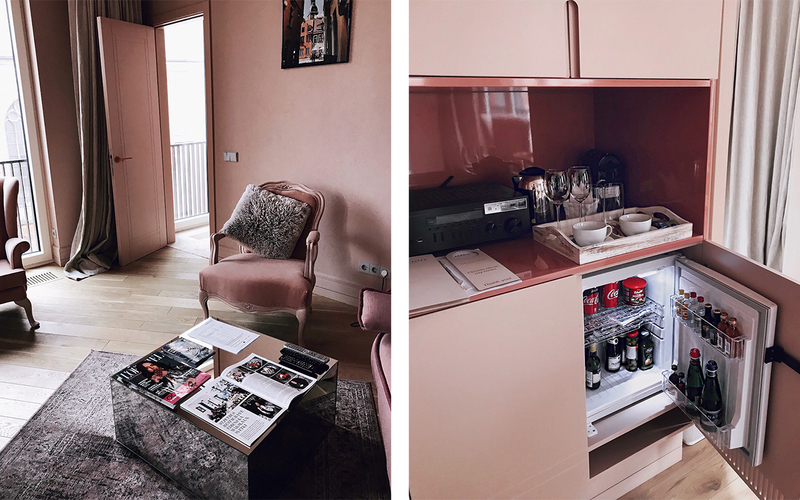 Can you imagine my surprise when I opened the door of our room (we were in the Royal Suite) and the most beautiful and aesthetically pleasant pink interior appeared in front of my eyes! Pink walls, pink doors, pink furniture, even a pink air conditioner!! In addition to that: massive panoramic windows in each room (including the bathroom!) 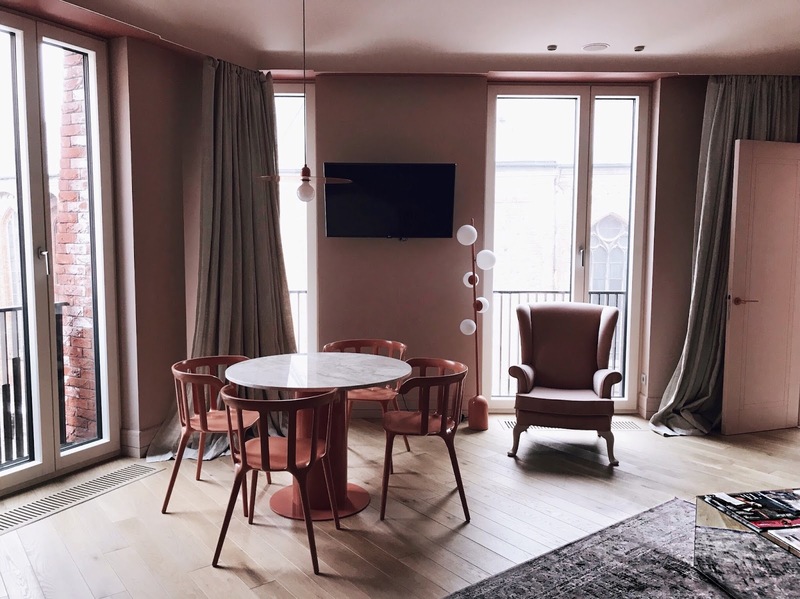 with a beautiful view to the Old Town, chocolates left on the pillows, stereo music coming from the ceiling installed speakers in every room, and a Nespresso coffee machine only for me! (Fil doesn’t drink coffee.) Ultimate goals! 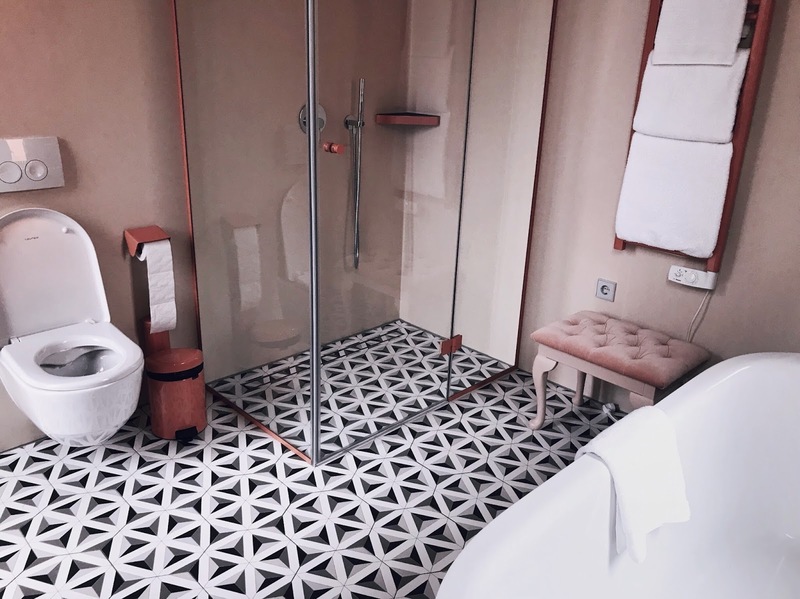 …was as Instagrammable and amazing as the interior! 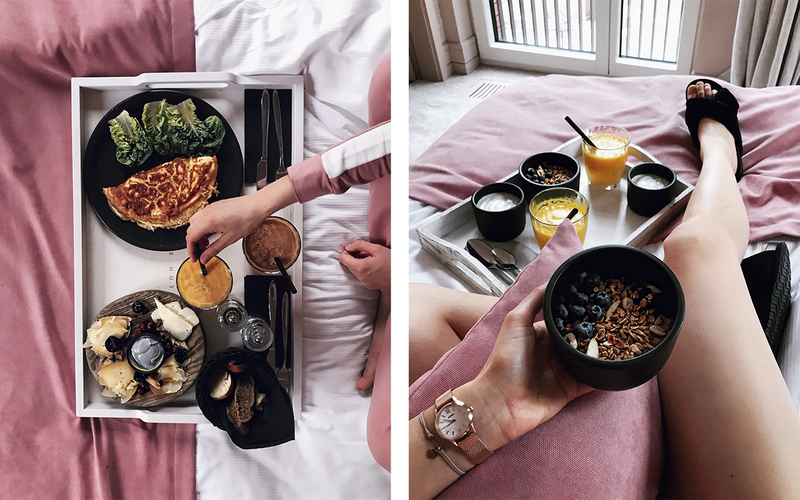 The breakfast is included in the package and it’s served in bed (literally) between 7-11am. You pick the time. 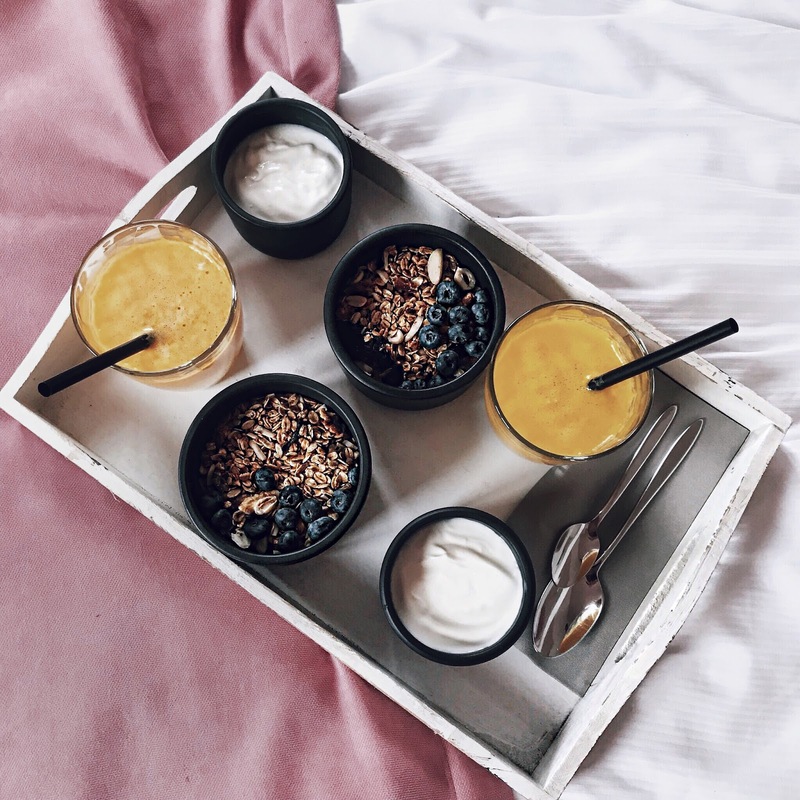 What Fil and I tried (and I’d recommend) is the granola with blueberry and yogurt, the cheese selection with homemade bread (so delicious!) and the omelette with cheese. As for drinks, I had freshly pressed orange and Fil had apple juice. It’s really hard to compare Riga to other places we’ve been to. As I said, each street transports you to a different world! The different parts of the Old Town reminded us of Amsterdam, Paris, London, Berlin, Milano, Corfu (in Greece) and even Sofia (in Bulgaria). So impressive! The other thing to notice is the colourfulness of Riga! I’ve been to so many places, but I don’t remember seeing such an artistic and colourful city before. Each building is painted in a different shade, it’s hard to see a plain white one. Even the cobbled streets were deeply coloured! We flew with Wizzair from London Luton Airport and the flight took around 2 hours. This time we went for the Wizz Plus option which includes Speedy Boarding and a up to 32kg bag in addition to your cabin one. I’ve never been sat in the front of the aeroplane before and I didn’t realise how much of a difference it makes! If you’ve been reading my blog for awhile or following me on Instagram, you’d probably know how much I love to travel! However, what you probably don’t know is that I have a very sensitive stomach and get very “travel sick”, so the actual transportation is the worst part for me in every trip. This time though, I am not sure if it was the front seating factor or the lack of stress when it comes to packing, knowing that I have enough space in my big suitcase and not having to worry about fitting everything in my small cabin bag, but I felt much better. The flight went quick and was a pleasant one! If you’re lucky enough you can get a flight with Wizzair from London to Riga for as little as £22.99. The currency in Latvia is euro. Fil and I exchanged £100 to have for food and transport in Riga, and that was enough for our weekend stay. The taxi from the airport to the hotel (11km disctance) was 12 euro. Here’s my pro-tip: before visiting a new place, I always spend some quality time in reading through TripAdvisor and writing down the best (and most affordable) activities and restaurants around where we stay. This way we can try as many new cuisines and explore as many sides as possible without having to spend a fortune. It’s a big money and time saver, especially if you travel on a budget like us. This was my list of “must try food places in Riga”: Folkklubs Ala Pagsabs, B Burgers, Spitaki, Food Box, Ezitis Migla, Terra Restoranti, Picas Meistars, and Big Bad Bagels. I’d totally recommend the Big Bad Bagels. Super yummy bagels and fresh smoothies on great price! We had an incredible weekend! It was indeed the city break we needed. Isn’t it incredible that we live in time that allows us to travel to so many places in the world, and within just a couple of hours you can be in a complete different place, with different sights, different people, and a whole new experience?! Where shall we go next? Any recommendations? P.S. Subscribe to my YouTube to see my vlog from Riga next week! P.S.2 Don’t forget to sign up for my VIP members list to be the first to receive invitations for events, giveaways, and the newest blog content! Riga is the best place to travel in the world. Last month I have a trip with my family for a week to Riga we visited the best places are there. We booked our tour with the help of Baltic transfer, it was a memorable trip. All the places are very interesting to visit and It's a nice view of the river Daugava in the sunset. Each street transports you to a different world! The different parts of the Old Town reminded us of Amsterdam. The best part is foods are very delicious and tasty I enjoyed it. Thank you for your post.